Four U.S. Air Force B-1B Lancer bombers assigned to the 9th Expeditionary Bomb Squadron deployed from Dyess Air Force Base, Texas, arrive at Andersen Air Force Base, Guam, Feb. 6, 2017. 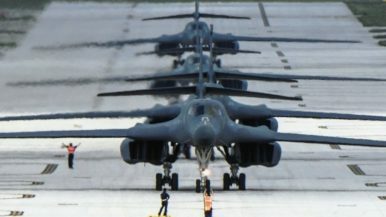 The United States Air Force (USAF) has deployed four B-1B Lancer heavy strategic bombers to Andersen Air Force Base on Guam in the Western Pacific. The deployment is in support of United States Pacific Command’s continuous bomber presence mission in the region. The four bombers of the USAF’s 9th Expeditionary Bomb Squadron (EBS) of the 7th Bomb Wing will replace the 34th EBS. B-1B bombers and over 300 Airmen from the 34th EBS of the 28th Bomb Wing first deployed to Guam from Ellsworth Air Force Base, South Dakota in August 2016. It marked the first deployment of B-1B bombers to Guam in over a decade. The supersonic Lancers replaced the base’s fleet of B-52H long-range heavy bombers. The USAF has routinely been stationing B-1, B-52H, and B-2 Spirit bombers in Guam since 2004. The B-1B Lancers from the 9th EBS, like their predecessors, will conduct routine, strategic deterrence patrols and regional training missions with allies and partner nations in order to enhance interoperability and to strengthen regional cooperation. “They will provide a significant rapid global strike capability that enables readiness and commitment to deterrence, offers assurance to the U.S. allies and strengthens regional security and stability in the region,” according to a Pentagon press release. Developed in the 1970s, the B-1 constitutes the backbone of the United States long-range bomber force.“The USAF’s 62 B-1B Lancers are capable of carrying up to 75,000 pounds (34,000 kilograms) of weapons—the largest payload of both guided and unguided weapons in the USAF’s inventory. Though heavily armed, the bomber can reach a top speed of Mach 1.2 and can operate at altitudes above 30,000 feet (9,100 meters),” as I explained elsewhere. In response, Pyongyang accused the United States of trying to launch a preemptive nuclear strike. However, the B-1B is no longer nuclear capable—the United States eliminated the nuclear mission for the bomber in 1994. The conversion of the USAF’s B-1 bomber fleet from nuclear to conventional began in 2007 and ended in 2011.